Baked vanilla flavoured cheesecake on a digestive biscuit base. Baked for creaminess. Rich cream cheese blended with single cream on a crunchy biscuit base. Our chefs were inspired by the traditional baked New York recipe to get an authentic thick and creamy cheesecake. 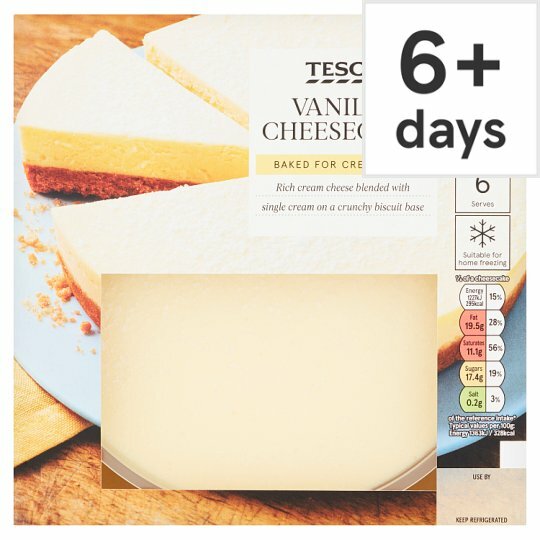 Full Fat Soft Cheese (22%), Single Cream (Milk), Sugar, Wheat Flour (Wheat Flour, Calcium Carbonate, Iron, Niacin, Thiamin), Soured Cream (Milk), Palm Oil, Pasteurised Egg, Rapeseed Oil, Wholemeal Wheat Flour, Cornflour, Invert Sugar Syrup, Demerara Sugar, Emulsifier (Lactic Acid Esters of Mono- and Di-Glycerides of Fatty Acids), Raising Agent (Ammonium Bicarbonate), Dextrose, Flavouring, Stabilisers (Xanthan Gum, Locust Bean Gum).